The comprehensive license agreement with Arm allows customers to select the most suitable Arm core to meet their requirements. We provide the most suitable Arm core and SNAP-DK (design kit), a design environment, for custom SoC for a wide range of applications such as microcontrollers, embedded device, and application equipment. These Arm cores in the line-up are available on all process technologies that Socionext offers. Use of the SNAP (Socionext Arm based SoC Platform) reduces development time and risks in Arm core-based SoC development. SNAP consist of the following. 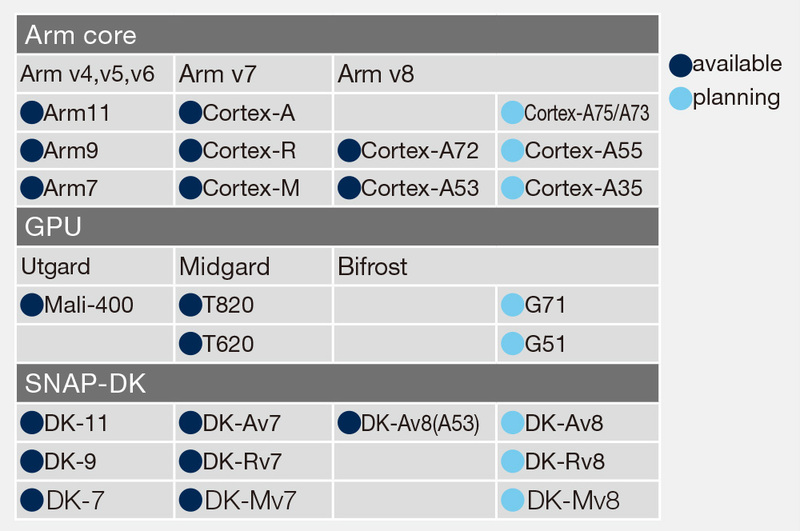 SNAP DK :Consists of an Arm core and minimum required peripheral IPs. 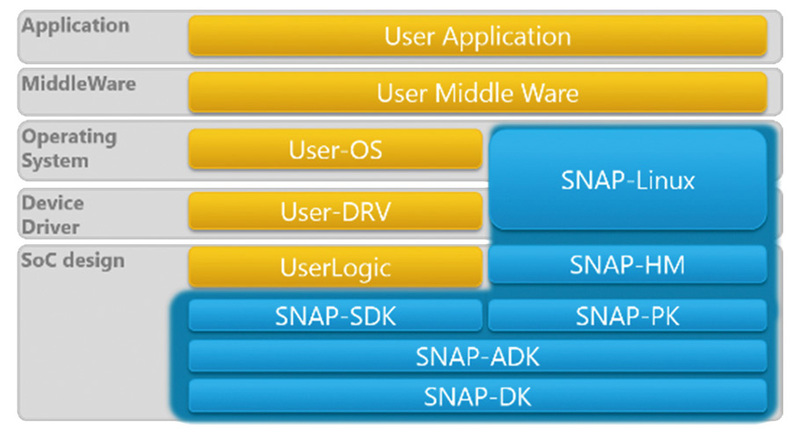 SNAP ADK:SNAP-DK-based design kit that al-ready implements an interface macro, GPU, etc. SNAP SDK:This design kit provides a fully customized dedicated subsystem for customers using a design tool in accordance with the requirement specifications. By selecting the most suitable design kit based on the specifications customers require, development time can be reduced significantly. These design kits, containing a simulation environment, test bench, sample boot code, etc., contribute to the shortening of time to launch the design environment and creation of an appropriate Arm core boot program. 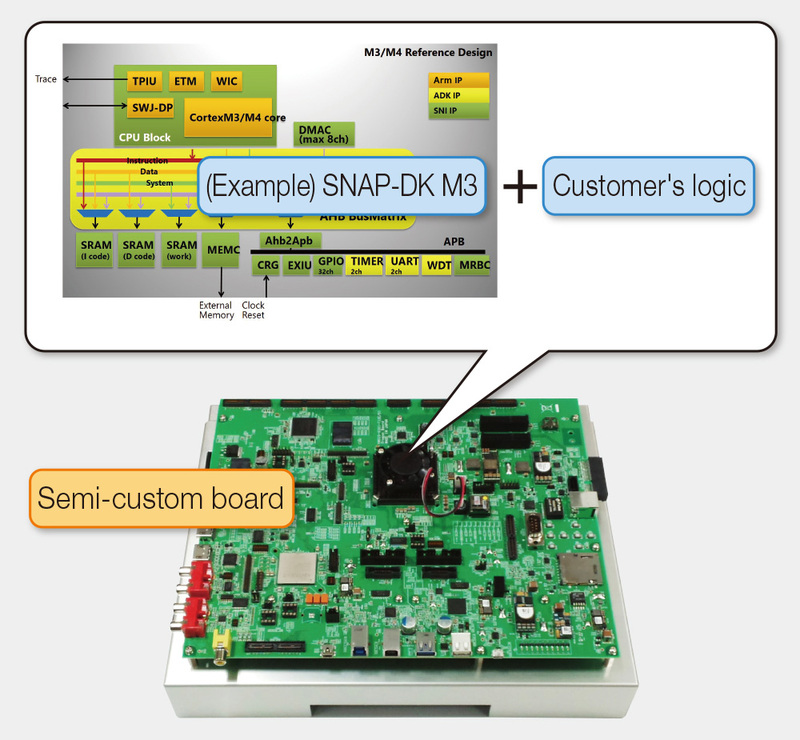 The SNAP-PK provides Socionext's unique FPGA board with SNAP-DK. By implementing a user logic on the FPGA side, it achieves prototyping of an SoC. This product can be used for system operation verification of hardware, performance evaluation, and early development of software. SNAP-Linux provides the Linux kernel for which operation has been checked on the SNAP-PK and various IP drivers. This product contributes to reducing software development time for customers.